The picture above is a link Summerset sent me, from SoVintage Patterns. Below is another link she sent me — this is a current Vogue pattern, 8182. Isn't it interesting how the illustration style makes the patterns seem so different, when really they're nearly identical? Look at what's conveyed through the posture of the women in the illustrations; the 1960s illustration is swaybacked, with hips thrust forward, while the more modern woman is standing completely straight (so much for your mother's injunction to stand up straight, you'll look better …). The bust point on the 1960s illustration is also a bit higher, and the surplice cross point is, too. I’m in the process of sewing a career wardrobe for my daughter and am using a vintage jacket pattern. In the pre-cad days before multisizing the fit was much closer to the body. It’s too bad Vogue didn’t just reissue the same pattern using the old draft. While Americans are fatter these days, the width of our shoulders hasn’t changed. This is something Chanel understands. The 1960’s illustration is much more appealing. It would be interesting to see if they marketed contemporary patterns with such glamorous images if they would sell more.I can’t be the only one who thinks the more current one is illustrated to look bland. I smiled and sighed when I saw the 50’s pattern, but I grimaced when I saw those modern drawings — the girls just look so sad. I suppose part of me is grateful for the more human realism, but it’s not inspiring. I’ll buy the dream version of the same pattern in a heartbeat. my mother had a dress almost exactly like the 60s pattern (it was in the 60s) made of a nice crepe de chine and a lace overlay. i still remember her in that dress going out to a fancy dinner with my father and both of them looking radiant. and has anyone noticed that the 60s women actually look like *women* who, even though slender, still have hips and a bust — while the modern ones look like they can barely stand up without assistance. patterns for the modern anorexic. Maybe there’s a fashion design STUDENT who reads this blog who’d be willing to run these two up as a class project…? Anyone?It is too bad about the modern illustrations. Though I’m just happy that there continue to be variations on the midriff band: high, wide, bias, faux belts, multiple tucks, pointed, shaped, ruched – keep them coming, says I! My dream is to have a whole stable of dresses like this, so that I can have apparently different looks while still always appearing to have a waistline. And you can bet I’ll be tossing my head back and showing my pearly whites (as in the top illustration) when that happens! I just bought the modern version of that pattern a few days ago – but I’m so much more inspired by it now that I’ve seen the vintage one! The scarf option on view B, vintage! Haven’t seen that in a modern pattern. It’s such a wow factor in the design. I also find that the modern patterns are bland and uninspiring. With gals who do not look happy to be dressed up. I buy vintage patterns and sew them with my daughter and now one of her friends. Nothing compares to the style and fit those old patterns give, or to the flattering they do for your figure.We were looking at dresses at a major department store yesterday evening. I remarked that if I were a size 6 I would never don one of those fancy ‘bags’ they had for sale. I bought the modern Vogue version of this pattern after realizing that I had bought three versions of what was basically that same dress, with skirt and midriff variations, over the course of a year. It seemed like a good investment to be able to make more of my own!I don’t know if it would have caught my eye if I hadn’t seen the dress in action first. That illustration is deadly. Vintage pattern illustrations, on the other hand, often present the opposite problem – they’re so glamorous that I think I like everything! It is the horrible prints on the dresses that make the new one look less appealing. Plus the orange color does nothing for the blonde. There are also no accessories in the new one.I love the vintage one. I have also noticed that I am more attracted to the vintage ones in the store as well. I hope they reissue this Butterwick one. I wish that I could read the back of the vintage pattern because I have a hunch that part of the difference might be the fabric recommendations. The vintage pattern illustration makes me think of a nice crisp taffeta or other fabric that “stands up” more while the modern print is suggesting very drapey fabrics like crepe and jersey. Maybe I’m reaching.Either way the modern pattern makes me think it would make me look dumpy while the vintage pattern makes me think it could turn me into Lana Turner. I’ll bet the ratio of bust to waist is a lot larger (i.e., the waist is a lot smaller) in the vintage pattern than in the modern pattern. Ah, for the days when women — including myself! — had waists!And la belladonna, you really must treat us all to your own blog. Believe me, if you can sew a complicated garment, you can use blogger. I sold that pattern to a customer the other day and lamented the fact that my figure couldn’t be shoved into that style of dress although I love them and could wear that style many years ago. Where are the Aunt Bea size patterns? Een heavier ladies looked stylish many years ago and now we have sacks to wear.I just love this blog…it is a ray of fun sunshine! Isn’t the bust point on the vintage pattern higher because the women were wearing those pointy bullet bras? Or do I have the wrong era?…no modern bra will lift you up and point you out in quite the same way. Erin, if anyone could get that grant for that set of pattern comparisons, it would be silver-tongued (silver-penned) (silver-keyboarded) YOU! Wow Erin, I love that vintage pattern. I would want to make one for every day of the week. Then figure out how to put sleeves on it so I could wear it in the wintertime too. Gidget Bananas is right about La Belladonna having her own blog. I would be a regular vistor there too. There has been more then a few times I wanted to go back and reread something she has commented on. Thanks La Belladonna for all your sound advice. It is much appriciated! The different posture of the pattern models is just part of why the vintage pattern looks more appealing than the modern one. The vintage artist was allowed more dash or elan in her or his rendering. The modern pattern has a very carefully drawn look, probably trying to more accurately portray the reality of the dress, rather than the romance of the dress. Also the vintage ladies are smiling delightedly while the modern women look definitely guarded in their enthusiasm. This was a fascinating Compare and Contrast post Erin, and I hope it becomes a recurring feature! Ah, the power of marketing. And the blissful celebration of the female form that no longer exists! No wonder women don’t sew as much anymore. They call that modern illustration inspiring?Bust-to-waist ratio may be larger, but girdles were also de riguere. For special occasions, it’s worth it to wear vintage and all its underpinnings. You’ll stand out, but no one will quite know why. And that’s the best way to stand out! WRT posture, I want to smack the girl in the orange dress on the newer pattern, and tell her to stand up straight. WRT to proper foundation wear, I don’t think any of the models in the modern illustration are wearing anything. Hence the saggy busts. When was the last time you saw a model wearing a bra, or one that really needed to? I notice that the back view of the modern pattern is identical to the front. I bet you could wear this dress backwards without a bra and not notice.Want to bet that to relly look like the vintage ladies we’d need serious brassieres and sturdy girdles? As we bemoan our lack of waists or marvel at the itty bitty waists of yore, let’s remember what it’s like to cram into a steel and elastic contraption. Wriggle yourself into one of those and see if you don’t get a figure. (ugh. Some things are best left in the dust of history. )The modern models all look so anorexic and weary. No smiles at all. The women in the vintage illustration look as if they know how to cook and eat, or else order nice things in fancy restuarants and enjoy them (because they deserve them). I agree about Bella *needing* a blog, except that I don’t want her to stop commenting here, either! With any luck she’ll have time for both.Or — I know! Maybe I should set up a dress wiki, and we can have links to things like alterations and whatnot? I also much prefer the vintage models. yes they are more stylised, but as everyone else has said it adds glamour and oomph! Though the vintage pattern seems to be targeted as a more cocktail/semi formal look while the modern is more every day look.Personally if I made this I would have to make the back a normal bodice shaped with princess seams or darts.As for undergarments, I have worn corsets and bustiers and the dramatic difference achieved is worth ever tiny bit of discomfort. Modern ones are made with streach fabric and plastic boning so you can still move and dance. I save them for special occasions as it is imposible to do them up without assistance.Love the blog Erin! It makes me smile everyday. Also of interest is the increase in pattern costs between the two! $.60 vs. $12???? Can anyone suggest a good source for foundation garments? I’d love to simulate a waist. Another difference in the illustration styles is the head-to-body ratio. Compare the head-body proportions of the glamorous lady in view C of the vintage pattern with the pinheaded ladies of the modern one. The head on the model in the modern green print dress looks like it was Photoshopped on. Personally, I think the larger head size makes a big difference in how much the pattern reaches out and grabs the viewer. That’s a good point about the intention of the artwork, Nancy. it’s worth remembering, as we sigh over the beautiful artwork of old, that many, many modern dressmakers complain about wanting more life-like representations of patterns on the cover, rather than idealised images. Others really prefer photographs of the made-up garment instead. After all, how many times have patterns come out looking (unintentionally) unlike the image?Perhaps it’s a factor of the relative skills of your average modern dressmaker, or perhaps it’s just a modern style of artwork. I don’t really know enough to analyse. 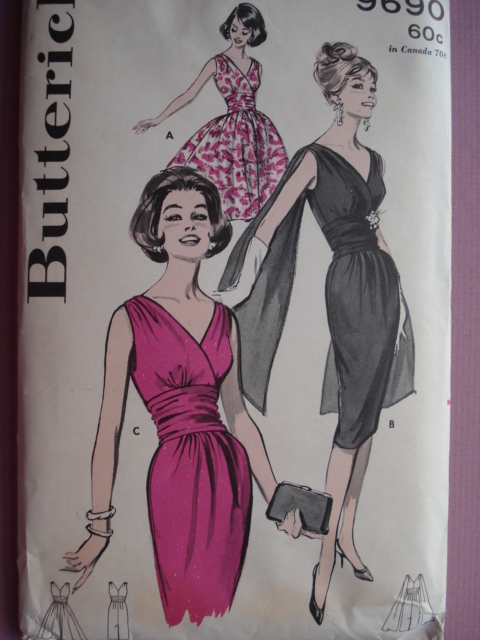 :)How accurate do people find the representations on vintage patterns? Interesting the contrast! When I sent Erin the dress, I only was looking at the *lines* of the dress and it sparked the old brain into what’s available in current patterns. I didn’t think about the models, but it makes perfect sense to. I think that’s one reason why vintage patterns are alluring to me – the grace and elegance portayed on the envelopes. There’s a joy, confidence and freedom (regardless of the bustiers and girdles that might be present), that the newer renderings don’t project. I have made some of the vintage patterns, and just as with modern patterns, the proportions in real life aren’t always the same. I have a Vogue Couturier pattern that I made up, and on the pattern the model’s heads look a little large for their bodies. Also, if the leg to body proportion is correct, in real life those ladies would be 10 feet tall. Doesn’t always translate well for a short-waisted shorty! I LOVE the vintage dresses! 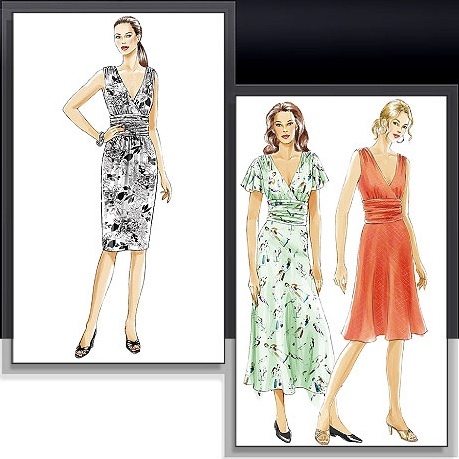 I would probably like the modern ones if the women looked happier to be wearing pretty dresses! Maybe I could get my mom to sew me the vintage A pattern. omg, I am absolutely in love with that sheath. I wish to god I sewed. YES! ADAD wiki! I can’t be the only one who has been searching the archives on a regular basis now for previous comments or to find that one dress that with that one collar. So YES! I love the idea of a wiki. Someone said in the comments a while back that they didn’t want the pattern, they just wanted some of whatever it was that made the vintage models so darn happy.Everyone else has picked up on the posture, which is a really good point, but I think a lot of it is also just on the facial expressions. I mean, come on, who doesn’t want to have those feelings displayed in the Butterick models faces? The Vogue girls look downright grim in comparision. DaD wiki! OMG, yes yes yes. Let me know if I can help. what a fabulous post! I am sure you can get someone to sponsor the time and effort. I wonder what the girls in the vogue pattern would look like with gloves? Or try http://www.whatkatiedid.com for the same sort of vintage-styled corsetry with vintage styled pictures! Um, I uh, like the new illustrations better. [ducks]I think the Vogue illustrator is less skilled, but as a presentation of what you can expect when you make the dress according to the pattern in the envelope I think it’s much more honest. The dress is not going to give you a waist. The dress is not going to raise your bustline. The dress is not going to transform you from a lumpy office worker with computer posture into a glamourous, coiffed, theatre-goer. It’s just a dress. And the Vogue illustration makes that clear. There are women who could wear acrylic pile seat covers and look achingly beautiful (Charlotte Gainsbourg comes to mind). And others who look dumpy in haute couture (check out the party photographs from Vogue magazine some time). Clothes are wonderful to play with, but they’re just clothes. Erin has hit on a home truth; besides being blog-impaired, I like it here. I’m very happy at Dress A Day! It doesn’t mean I don’t want my own little place at some point, but if Erin can find a way to house me and my wiki, wiki ways, that would be a Good Thing for all parties, yes? And maybe at some point, Erin would like to incorporate a “search” feature here at DaD, so that if anyone wanted to search on “midriff band” or “bra” or “La BellaDonna,” that could be done?I had another nice long post eaten yesterday, in which I answered Becky: It was indeed the era of the pointy bra, and bras do make a difference; so much so, that if you are wearing a Special Bra for a Special Event, you need to make certain that you fit your Special Outfit over that particular bra, or the results could be spectacularly disappointing. However, in this particular instance, even if all other factors were equal, what the illustrators are showing is the lifted rib cage, which is actually a very graceful posture point all of us can (generally) do without discomfort, and no corseting. Keep in mind that, for the most part, the patterns for the 1940s and most of the 1950s list a bust/waist difference of six inches, and a waist/hip difference of nine inches – not so very different, in fact, from many current patterns. There is a period in the 1950s where patterns are resized, and not just numerically; that is, a size 14 suddenly has a Bust 34, instead of a Bust 32, but there is also (on one of my patterns, at least) an eight-inch bust/waist hip difference; I believe one pattern may even have a ten-inch bust/waist/hip difference, but I have to check, because I might be fibbing. However, by and large, the six-inch/nine-inch difference seems to have been, and still is, the most common proportion for which patterns are made. (And remember, that “six-inch bust/waist difference” is for a B-cup bosom! )Gail, I hear you! Why is it that once upon a time, before we had all the advantages of Modern Improvements, designers could make dresses with real shapes for larger ladies? In the meantime, you may want to check here: http://patternsfromthepast.com/larger.htmlAggiebot5 Ill hold her while you smack her. Its absolutely true. In the 1970s, the bust point was dropped (about a half-inch, I think) across all the pattern companies, to accommodate all the women who were no longer wearing bras. Speaking as someone with a fair amount of acreage, Im not comfortable without a bra on; too much opportunity to injure myself or innocent passersby! However … Im willing to bypass the girdles, on the grounds that I already have more than that nine-inch waist/hip difference! (Although its true that if your support garments are properly fitted to you, then they should be reasonably comfortable. )Sarah, if Im looking at patterns in a hurry, and I really want to know what the thing looks like, I go straight to the line drawing on the envelope. Ive often found that the wonderfully full swirling skirt on a princess-line dress turns out not to be as full as something I already own!CMC, sometimes it really is a matter of Your Mileage May Vary; I actually have the same posture as those ladies in the vintage pattern (I actually have the same long neck and type of waist, too, which probably explains why I like these patterns so much!). Their heads are actually in good proportion to their bodies, but they do have some Big Hair going on there, dont they? Even the hair looks more alert, somehow, than in the modern versions. Erin, I like the wiki idea, though I’m not sure how that would work. I had been thinking of suggesting that you start a discussion group, like on Yahoo Groups, so we could continue conversations over several days, search for topics and threads, etc. Carol,One company that makes vintage-reproduction undergarments is http://www.secretsinlace.com They have pointy bras, stockings, garters, and girdles of various sorts. Also, you can frequently find deadstock girdles & etc. in the vintage clothing sections of ebay. I try always to look at the line drawing to see what its really like. Even in a photograph, the model might have a bunch of clothes pins holding the garment more snugly to her. And the fabric seems to have an influence as well. And fabric can make all the difference! I think both the vintage and modern illustrations are exaggerated, but in different ways. The vitange ladies are drawn to have impossibly tiny waists. If you measured Miss B-32 and her waist was as proportionately small as it is in the pattern picture, it’d be about 19″. Shyeah, right. The modern models, if the B-32 or 34 is accurate, would be about 6’4″ tall. In the 1950’s, the hourglass was in vogue. Today, the slouchy giraffe is preferred. Where does that leave the modern 36-25-33 at 5’2.5″? Looking for flattering clothes, that’s where! ents. Diagonal lines help to break up the mass, and can even create the illusion of a waist (think wrap dress). The worst silhouette for the Apple is the T-Shirt and Leggings – which is, fairly often, the choice that many Apples make. The tight lower garments emphasize the narrowness of the lower body, and the baggy upper garment emphasizes the bulk of upper body. This is why the Apple is better off not trying to create the silhouette of the Upside-Down Triangle even if it was her original body shape. In point of fact, it is often the Upside-Down Triangle who may become something of an Apple as she gains weight; the Upside-Down Triangle is the body type least likely to accumulate weight on her lower body, which pretty much leaves the upper part of the body and the middle of the body (i.e., the waist) as the area where weight accumulates, and voila! The Apple is the result. When the Ruler puts weight on, if she puts weight on all over, she remains a Ruler; shes just a larger version. The Ruler is, in fact, more likely to put weight on evenly, or to put it on at her waist, than she is likely to accumulate it all in her bust, or all in her hips. If the Ruler puts the weight on at her middle, she dresses as if she were a Pear fitted where she is narrow (upper body), and flaring out. The Apple has more trial-and-error going for her than the others; she needs to experiment with the shapes from the 20s, and the A-Line shapes that have been suggested for the Pear. The Salwar Kameez, in fact, is a good direction for the Apple to explore, as is the Empire Line suggested to Well-Rounded Dresser in my post to her on November 9, 2006. It is very, very important for the Apple to have her clothes fit her well through the shoulders and upper body. Anonymous 7:14 If you like the pattern, it most certainly is for petites. Even if it isn’t SIZED for petites, the design itself will be as flattering to the petite figure as to the average or tall figure.Depressing Fact of Life: If you are a petite person, you will spend a lot of time altering patterns to a petite size. Now, not all patterns – some patterns are offered as petite sizes – but most of them. It’s a pretty standard set of alterations, though, and that’s just the way life is. I’ll spend my entire life shortening every pattern I buy through the back, and making full bust alterations, and enlarging and lengthening any sleeves. That’s just the way life, and my build, happen to be. You are better off arming yourself with Palmer & Alto’s Fit for Real People, which shows how to do the standard, across-the-board alterations so that a petite can use any ordinary pattern. And if you like the pattern, buy it, so you’re not haunting the internet 10 years from now trying to pick it up! The fabric will come to you in time.General Note: If you see it and you love it, and you can get it without harming yourself financially, get it! If it’s a pattern, the fabric will come. If it’s fabric, you either have the right pattern at home, or you will eventually find the right pattern for it. Life’s too short to spend regretting the little things that could have brought us pleasure. I own a copy of the modern Vogue pattern, which I’d been intending to “get around” to doing… funny how much more motivated I feel after viewing the vintage illustrations of what is essentially the same dress – I find the swayback pose, glamour girl smiles and less fussy materials FAR more appealing! I have BOTH of those patterns! I never realized how similar they are. My 17 year old desperatly wants the vintage one made up!